Tournament Shark will attach itself to each of your tournament tables (including SNGs) and display each of your opponent's relevant statistics. Knowing how well each opponent plays, where they typically finish, and how often they play are incredibly valuable. If you are a frequent tournament player, Tournament Shark will pay for itself quickly. Poker Pro Labs has done a fantastic job with Tournament Shark. With all of the features and vast amounts of information that the program provides, we expected Tournament Shark to really eat up processing time, but it runs smooth as silk and didn't cause a single problem during the time we spent reviewing it. The traditional method of looking up player’s statistics in a database usually means searching for each player one at a time, which can be very time-consuming. Tournament Shark has taken the leg work out of looking up your opponents' statistics. 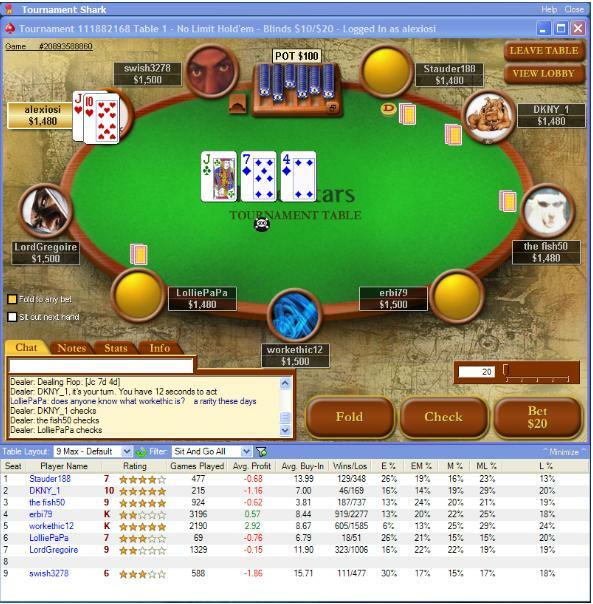 Just start playing and you will instantly see various statistics about the players at your table. You even utilize advanced filter options that will allow you to choose different tournament types, time periods, game types, buy-in levels, and number of entrants. You can also adjust Tournament Shark's general preferences. For example, if you want Tournament Shark to launch every time you start up your computer, you can do so. For serious sit and go or multi-table tournament players, this program is an absolute must have. If you aren't using it on your opponents, then you are definitely losing value at the tables. Ilove the way this software attaches right to your table. Know more about them than they know about you!